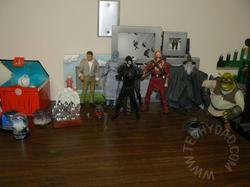 As you probably read on TheAngelForever.com, we saw Toy Story 3 on Sunday. It was a powerful movie and it is quite amazing how Pixar keeps topping themselves. I keep thinking "There’s no way they’ll beat this" and then they go and beat it. I won’t spoil anything but I don’t think that it’s a spoiler to mention that the movie is about Andy going to college and what happens to his once-beloved toys when he goes. 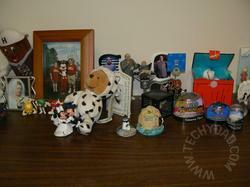 The toys long for playtime and Andy just keeps them in a toy chest, forgotten and unplayed with. 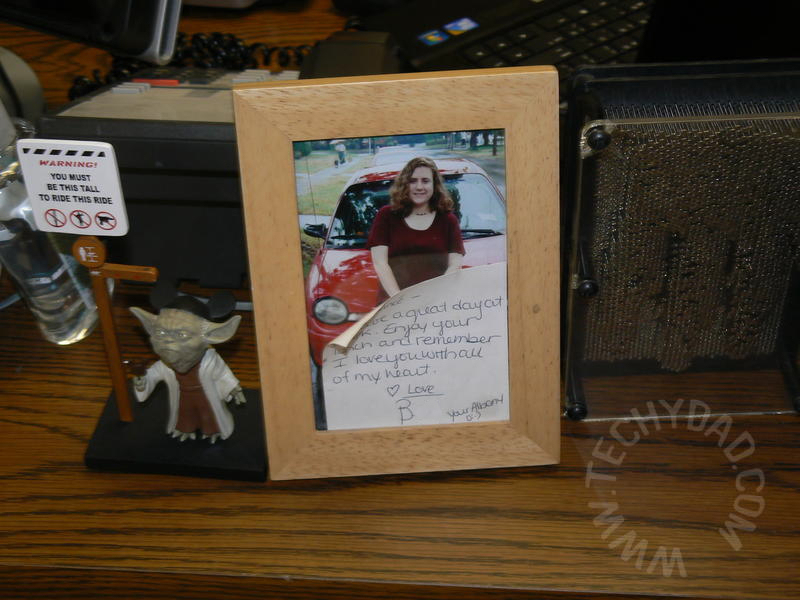 A few days ago, I looked through my office. I have quite a collection of toys, momentos, pictures and other assorted items that I’ve collected over the years. Most of them have some sort of sentiment attached to them. Let’s go on a tour, shall we? Starting from the left and heading right is the head of Dilbert’s boss. This is actually a "silly slammer." You hit it and it says things like "I’m the boss. It doesn’t have to make sense!" 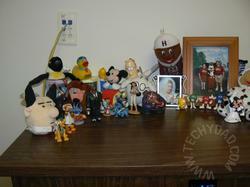 Then there’s Tigger and Pluto from our Disney World honeymoon. Behind them is Humphrey the Bear who was given to us by a Disney World tour guide upon finding out we were newlyweds on our honeymoon. Behind him is a canner penguin from a trip to Montreal we took prior to being married. Behind that is a Long Island Ducks rubber duckie. The Ducks are a baseball team near where my parents live. Moving on we find the characters from Lilo and Stitch, another Disney movie I loved. 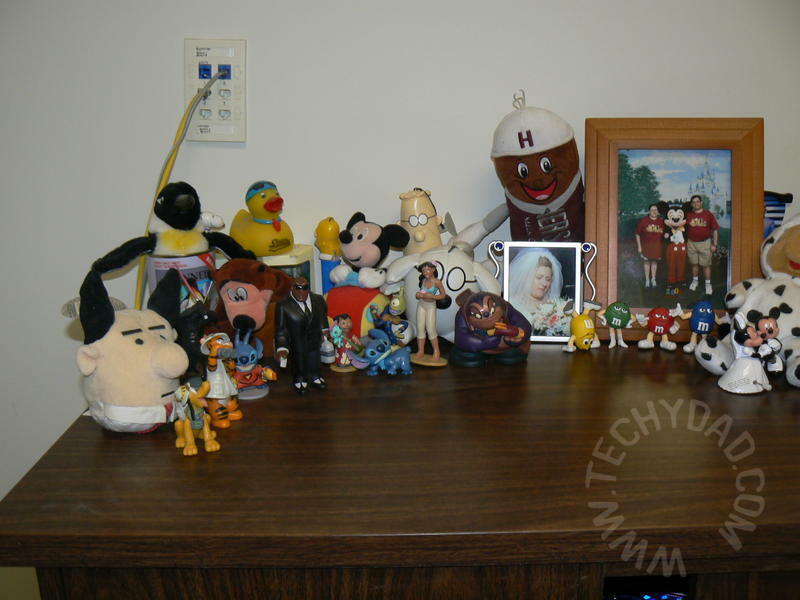 Behind them is a Homer Simpson Pez dispenser, Mickey in a car, Dilbert and Dogbert. After them is a stuffed Hershey bar from when we visited Hershey, PA. The photos are B at our wedding and B and I with Mickey on our honeymoon. Finally, there’s the M&M guys from a trip to the M&Ms store in Las Vegas just before finding out B was pregnant with NHL. That crystal and the little "eye guys" are from our trip to Howe Caverns while B was pregnant with NHL. Behind them is a penguin keepsake from our trip to Montreal. Next to them are my Farscape guys: John Crichton, Zhaan, Scorpious (with shrunken Hynerian head), Chianna, and D’Argo. They’re joined by Gandalf and Shrek. Quite the combination, huh? Not pictured (mainly because he hasn’t been dusted in far too long) is a Spiderman toy perched on a Gargoyle affixed to my wall. A web head covered in cobwebs is irony not laziness, right? On top of my computer resides an Easy Button, Super Grover and Oscar from our trip to Sesame Place, a talking C-3PO that I picked up from a going-out-of-business KB Toys, Photographer Goofy from last year’s Disney World trip and a couple of DRDs who wandered away from the other Farscape guys. 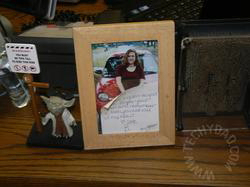 Finally, there’s the front of my desk where I have my "Judge Me By My Size" Yoda from our most recent Disney World trip, the first photo of B that she sent me (along with the note she wrote me after we were engaged) and a pinscreen. 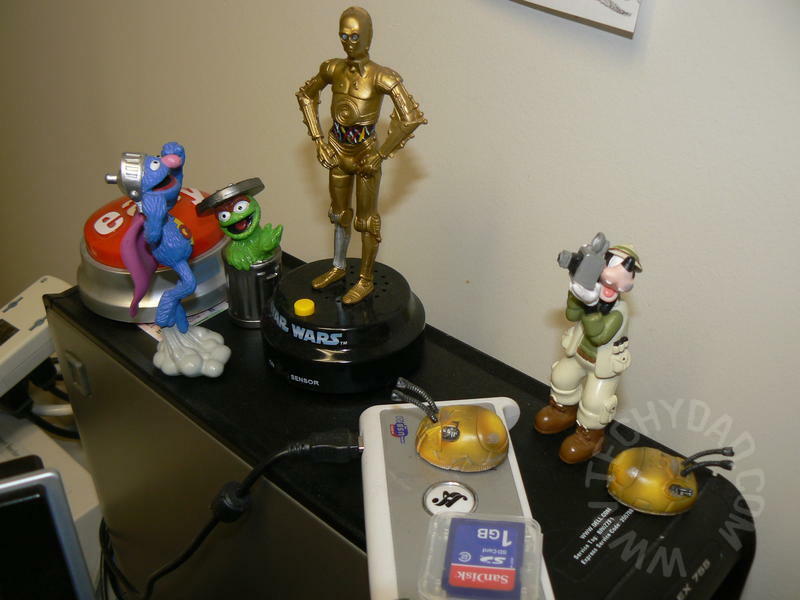 And that concludes my tour of my office toys/momentos. Getting back to Toy Story 3, I can’t help but wonder, when I shut the lights off at night, do my toys come alive and have parties?